Today at an event in Los Angeles, Bungie gave us our first look at Destiny 2, a video game about the crazy antics of Peter Dinklage. It’ll be out on September 8 for PS4, Xbox One, and PC. They’ve changed Crucible to 4v4 for all modes. 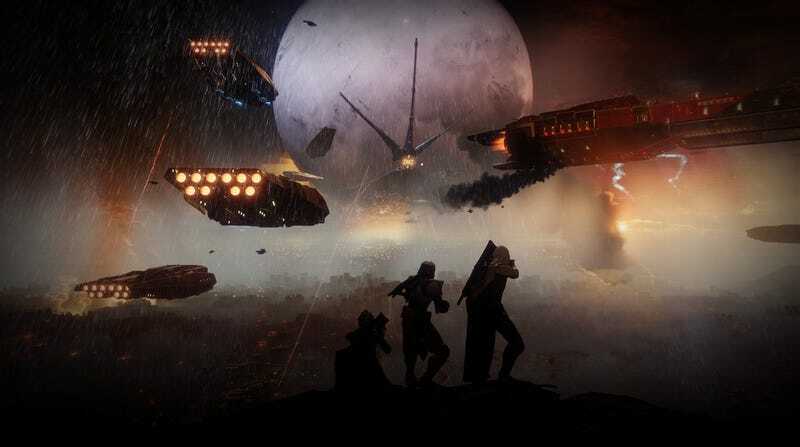 They’re going to make Trials, raids, and the Nightfall “available to all players,” which they’re doing with a brand new system called Guided Games that will allow in-game Clans to sherpa players through that tougher endgame content. The PC version of Destiny 2 will be on Blizzard’s Battle.net rather than Steam or another platform. Although the console versions run at 30FPS, Destiny 2 will have an uncapped framerate on PC. At the end of this mission, Smith said, the forces of good will be defeated. Players will lose their city, their powers, and their vaults to the Cabal’s Red Legion and their big baddy, Commander Ghaul. The goal of Destiny 2 is to go out, get your stuff back, and take down Ghaul. Bungie’s saying Destiny 2 will launch with new strikes, PVP modes, and (sadly) just one raid. You’ll get three weapon slots that are more flexible than Destiny 1's, called Kinetic, Energy, and Power. It sounds like you’ll be able to shuffle your weapons around and use the same types of weapons in multiple spots this time around. New classes include the Warlock’s Dawnblade, complete with flaming sword, the Titan’s Sentinel, with a void Captain America shield, and the Hunter’s Arcstrider, with an electric staff. Bungie introduced a new PVP mode called Countdown in which players will have to place a bomb in their opponents’ base and then guard it. Destiny 2 will allow players to launch activities from within anywhere in the world, without having to go to orbit (thank goodness). Rather than solely letting you wander around and do patrol missions, Destiny 2's maps will have treasure hunts, activities, and dungeons called Lost Sectors that sure sound a lot like Diablo. Destiny 2 will have a more robust clan system, with in-game rosters, customizable banners, and other tools that’ll make it easier to show everyone that you’re part of Team Kotaku. Bungie also announced a system called “Guided Games” that will allow players to join up with clans—even if those players aren’t members—for Destiny 2's more complex end-game content, like raids and Nightfalls. This is Destiny 2's version of matchmaking. It’s basically an in-game LFG system. If you’re raiding and need an extra slot, you can open up your group to a player looking for a raid. From what we’ve seen so far, this looks more like Destiny 1.5 than a brand new game. But of course we’ll reserve judgement until we’ve seen the whole game in action—and gotten a chance to play it for a while.